Mistakes happen, and everyone looooves to sue. If you want to keep your salon open, you have to protect yourself. We have some examples coming up about what can happen where you end up on the wrong end of a lawsuit! He only asked for a trim! There are two kinds of salon insurance you will need to have. The first is called ‘general liability salon insurance‘. It’s the most basic and necessary. Next is ‘professional salon liability insurance’. They are both crucial due to the different types of incidents that can happen at a salon. If you have been doing hair for long, whether you own a salon or you are an employee at a salon, you have surely seen incidents and accidents! Accidents can range from hair being scorched to scalp burns to someone falling in the salon. If you are not protected, guess what? Yep, you will likely end up in a lawsuit. You could lose it all. There’s no way you want that to happen. Therefore, if you aren’t already covered, you had better get yourself covered immediately! Let’s have a closer look at both. General liability hair salon insurance for hairdressers protects against when you get sued for bodily injury. You will be covered to the extent you are liable up to your policy limits. It also covers related medical costs. Karl came into your salon for a trim. He’s been waiting in the lobby reading a magazine. He gets up to hit the restroom before he’s called. You already know the end of this story, eh? You guessed it, he’s going to sue you for the damages, pain and suffering and maybe for a little more just for his trouble. This is the type of case that general liability bodily injury will cover. If someone is hurt while on your premises, but he wasn’t injured during a service, well, that’s general liability. Professional liability covers when the service directly harms the customer. Just how many ways can this end up in a lawsuit?? A bride wants you to come to her church to do her bridesmaids hair. You get there and start curling away. Everyone is having a great time, the bridesmaids are drinking and excitement is in the air. You are not drinking, of course. You are not drinking, of course. Still you are enjoying the feeling in the air and you are invited to the wedding now. The bridesmaid you are working on asks you if you would get her a glass of red wine. You are happy to. You get it and as you are walking back with it, you trip over your own feet. In what seems like slow motion, the wine and the glass go flying. You crash to the ground but nobody is trying to help you up or find out if you are hurt. This seems strange to you. When you look up, you immediately realize the reason why. Everyone is looking at the bride. To your horror, you see that the wine spilled all over the bride. Who is wearing her wedding dress. And who is now screaming. Right at you. The wedding is ‘ruined’ according to the bride. She can’t afford to replace it and can’t get a replacement within an hour either way. She will be coming after you. Emotional distress and for the cost of the dress. Maybe for the cost of the entire wedding if she cancels it. This type of property damage will be covered by general liability hair stylist insurance. There’s no insurance to console the bride. You feel awful, but accidents happen. As you can see, you need to be covered. As you can see, you need to be covered. Um, I said brunette, not blonde!! Cindy is one of your stylists. She has a lady come in who asked for her hair to be relaxed. Cindy agrees and starts the process. After some time in the chair, the client starts to complain that her scalp feels like it’s burning. She is understandably pissed. She sues your company for damages, loss of wages as well as emotional distress. (Uh-oh.) This is the type of claim that professional liability salon insurance will cover you for. 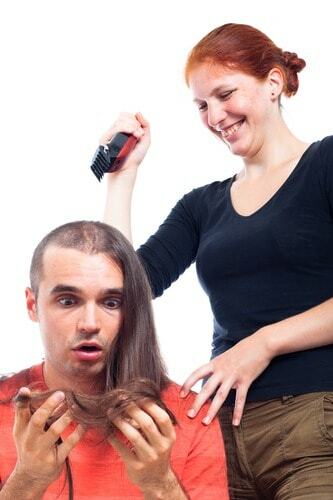 This is where hair stylist liability insurance comes to your rescue! Where Do I Get My Insurance? We have found that Hiscox is number one for your hair salon insurance needs. It’s the simplest and fastest way to get no-obligation insurance quotes from different insurance carriers. To get your FREE hair salon insurance quotes, simply go to Hiscox, fill out their online form and speak with a representative if you have additional questions. They will find out more about your needs personally and get you set up so you are protected. You have a business. It’s a good business. You need to protect it so that you don’t lose it!